The email came to me one afternoon a couple of weeks beforehand. "Can you book somewhere for your father's birthday? 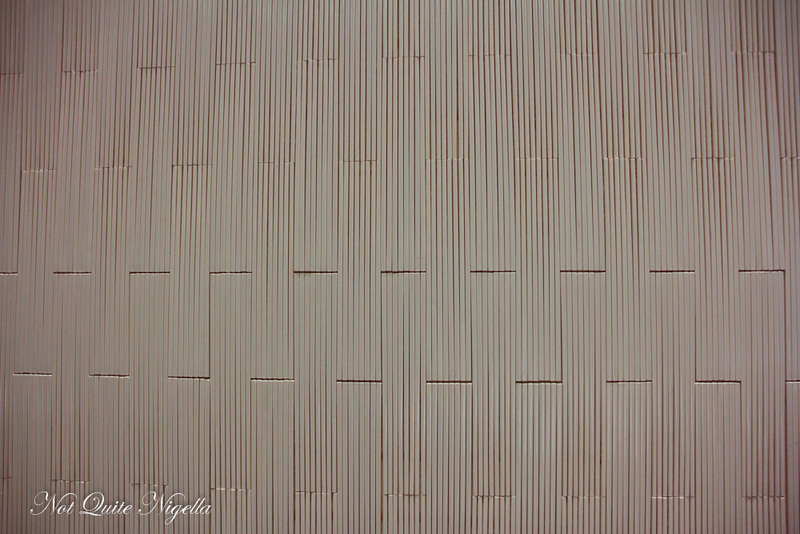 If they charge a surcharge, then book for the following day" my mother said. I chuckled and marvelled at how his birthday would be moved to save the surcharge - and knowing my father he wouldn't care a jot. 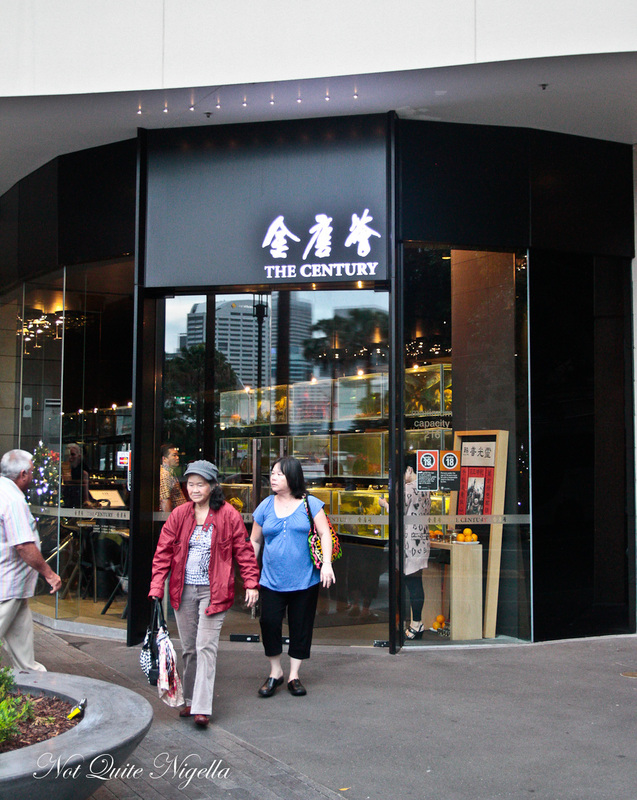 I booked us into The Century, lured by the fact that for his birthday we like to have a seafood feast and The Century, the outpost by Golden Century features 15 live seafood tanks at the entrance just in case you didn't know what their speciality is. 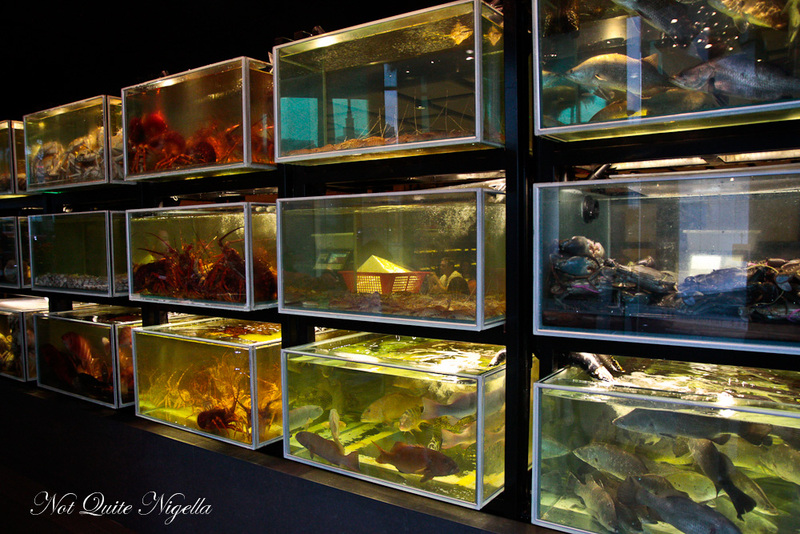 In 2011 Golden Century served 108 tonnes of seafood from pippies, live lobster, king crab, abalone and prawns. 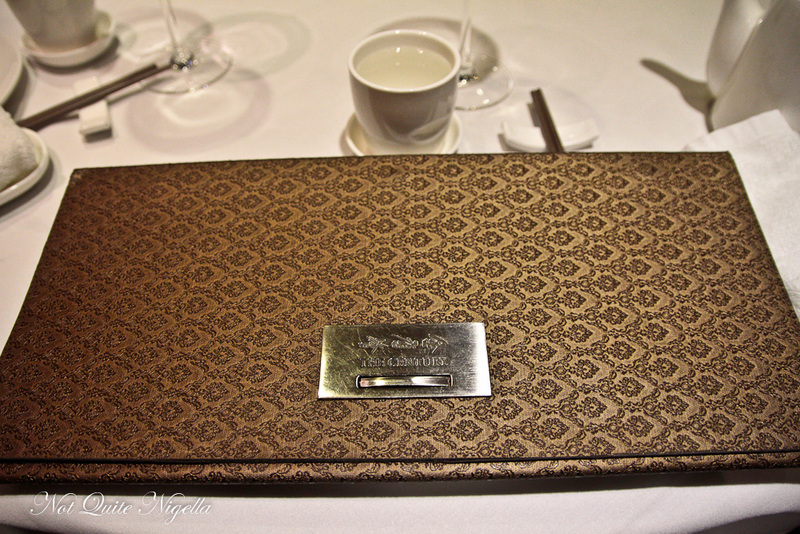 We're handed menus which resemble huge flat embroidered clutch bags. 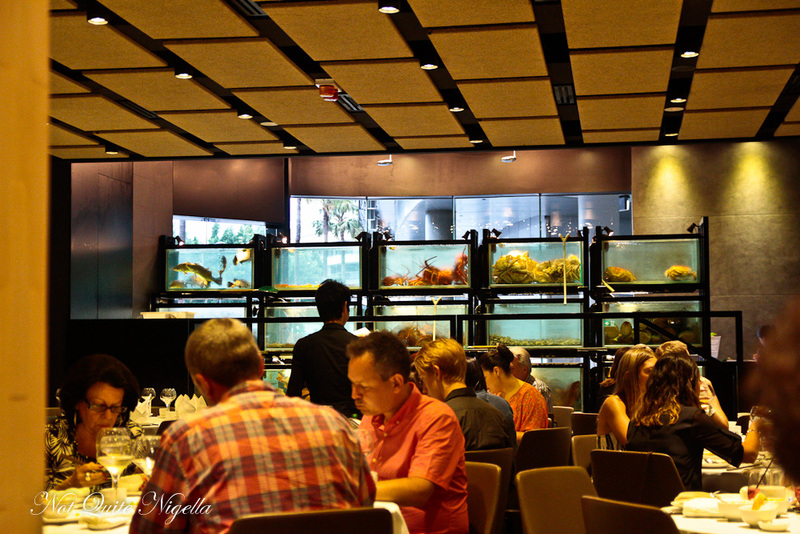 I take a food one with a separate laminated live seafood menu and Mr NQN takes the drink menu. "Do you mind if I order a glass of wine?" he says mildly. My family drop their menus and stare at him as if he had just landed from the ceiling. "Just kidding!" he says and they relax - my parents are notorious non drinkers who equate people that drink hard spirits with the underworld. Mr NQN points out a few bottles of $399,000 wine. The eggplant cubes come out first. 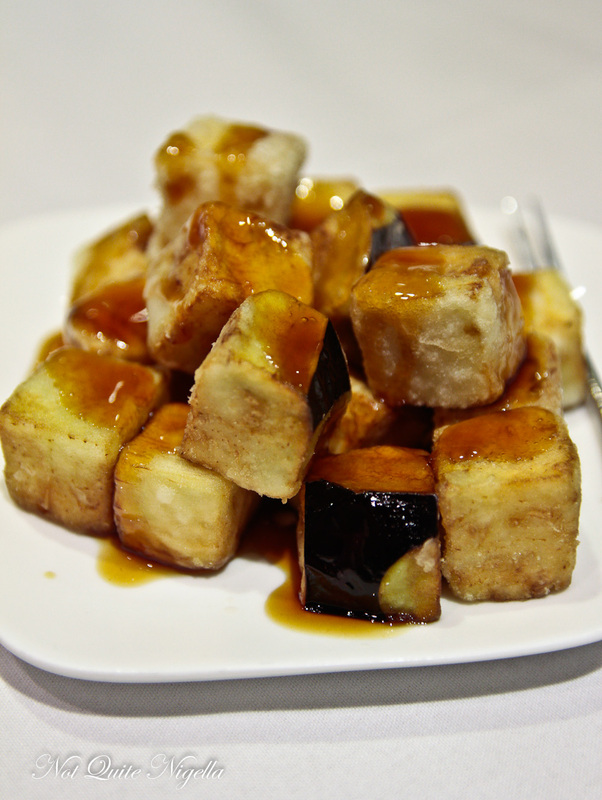 Our family loves eggplant as a vegetable and these are deep fried cubes with a crispy coating and a soft creamy centre. The sauce drizzled on top has a sweetness to it too which makes these crunchy cubes moreish. 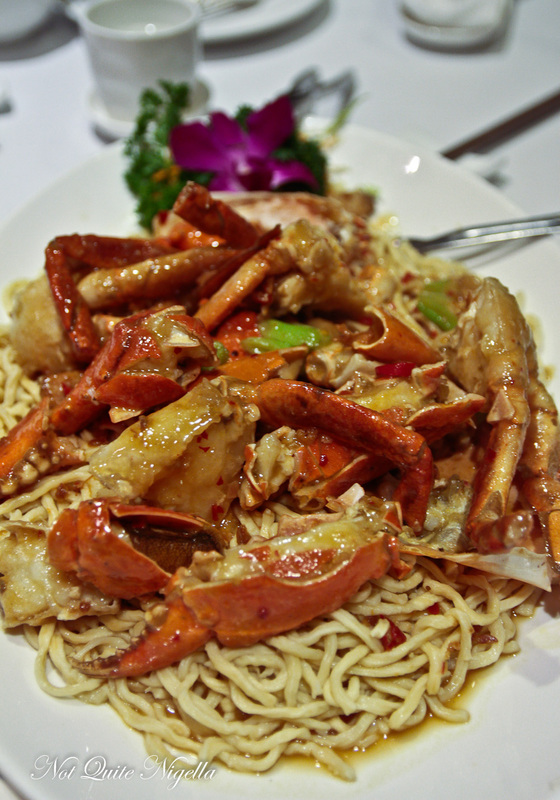 We are all absolute fiends for mudcrab and we asked for three lots of noodles. Actually my father who never really pipes up when ordering suggested three lots of noodles and since this is his birthday dinner we figure why not. While the crab meat has a fantastic texture, unfortunately the sauce is very diluted and disappointing. 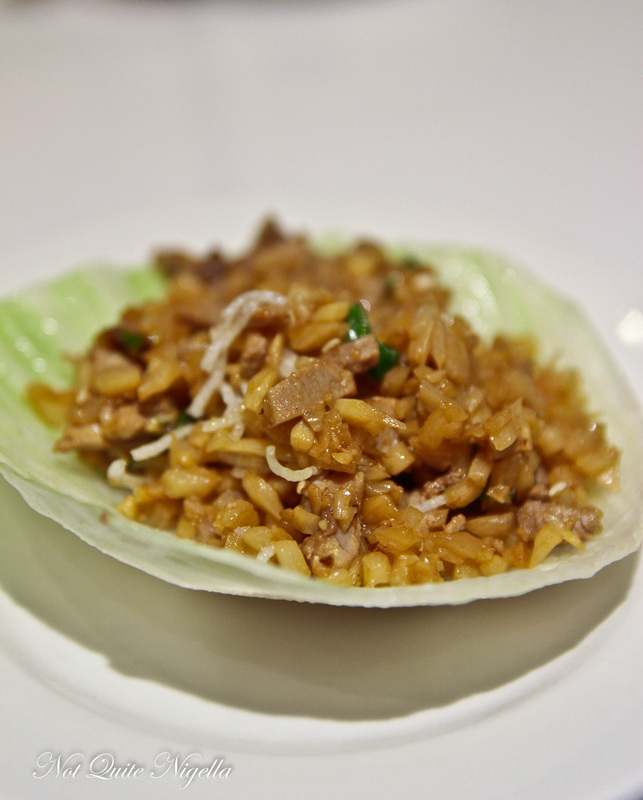 I love the strong concentration of flavours with XO sauce and the intensity of them and the sauce was a pale imitation of XO sauce crab. With half a Peking Duck you get four pancakes but they put together five pancakes for us with a small surcharge. 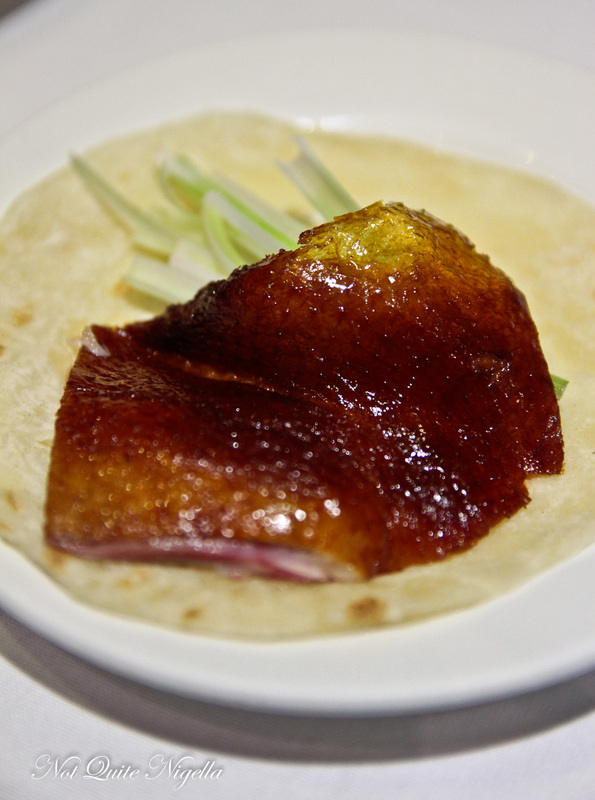 On our Peking Duck challenge, we all loved the Peking Duck at Golden Century and family birthday dinners always feature a Peking duck. Here the skin isn't very crispy at all and there's a lot of meat in the pancake. 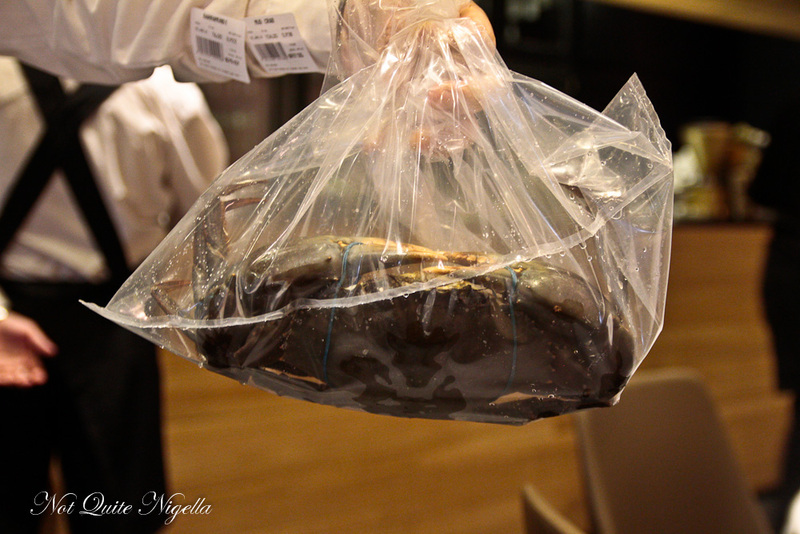 The sang choi bau filling has a lot of water chestnut in it to give it crunch. Things start looking up. 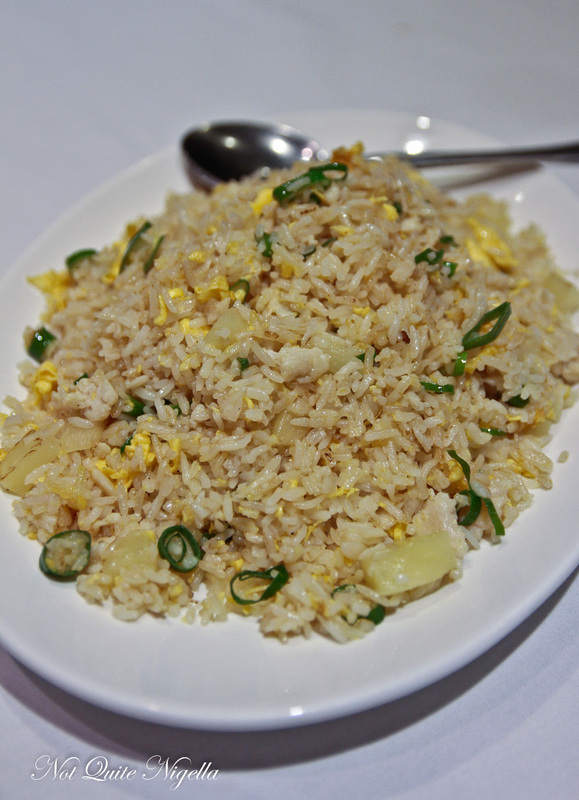 We asked for the fried rice to come at the beginning instead of at the end and it comes out quickly. There are small cubes of pineapple and chicken along with egg and I can't help but go back for spoonful after spoonful of this. 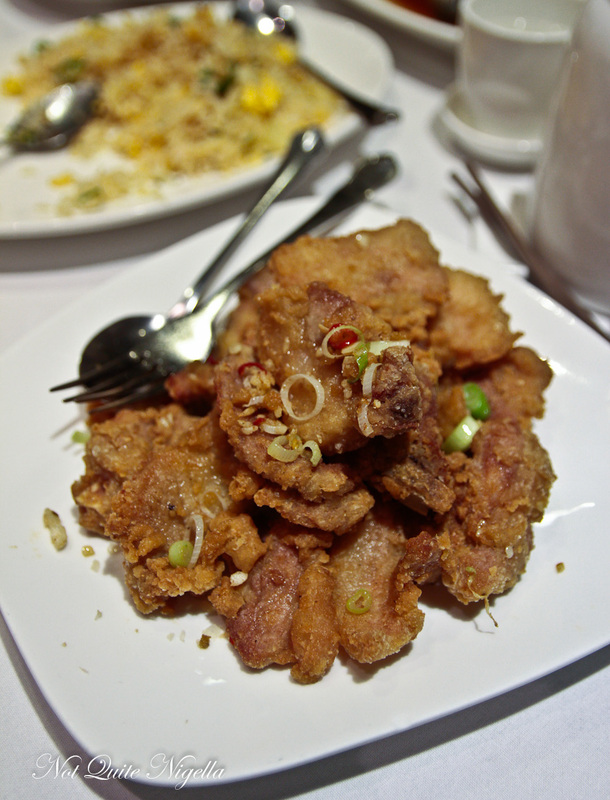 The salt and pepper pork ribs are not particularly unusual but we all like how crunchy the coating on the pork ribs is and how perfectly seasoned they are with the salt and pepper mixture. By the time this dish came out, we were totally full but I have to say that the service here was very attentive taking time to debone the barramundi well and change our plates. 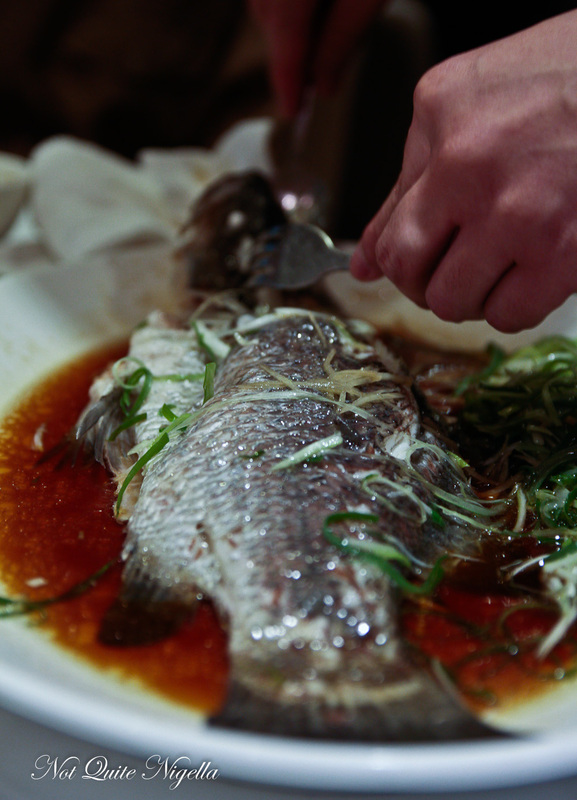 The steamed barramundi is served with ginger and shallots. As much as I love broccoli, I ate too much of the rest to really be able to fit this in. 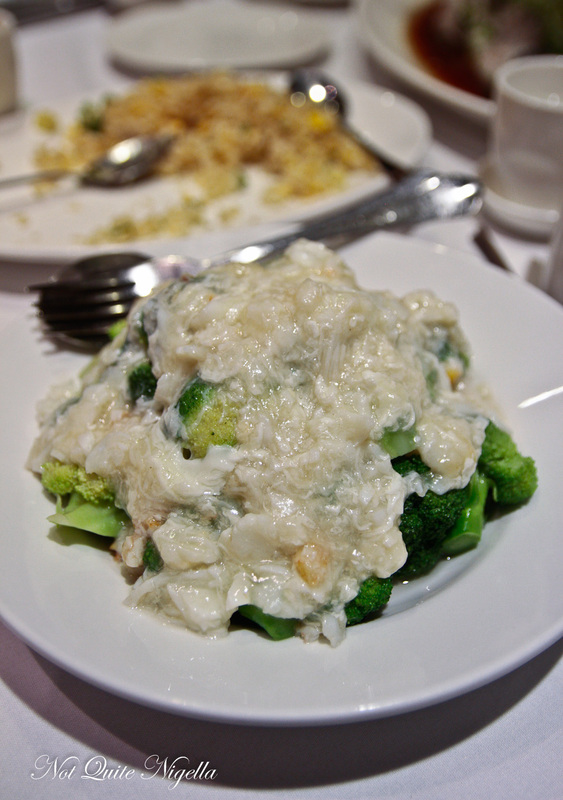 They're steamed florets of broccoli coated in an egg white and crab meat mixture. 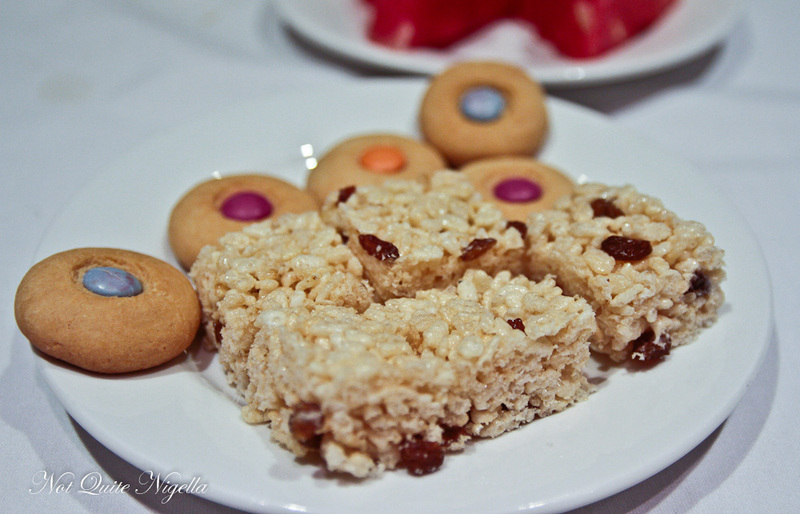 We don't often bother ordering dessert unless there's something special on the menu and they bring out a plate of watermelon slices and some rice crispy slice with raisins and Smarties cookies. 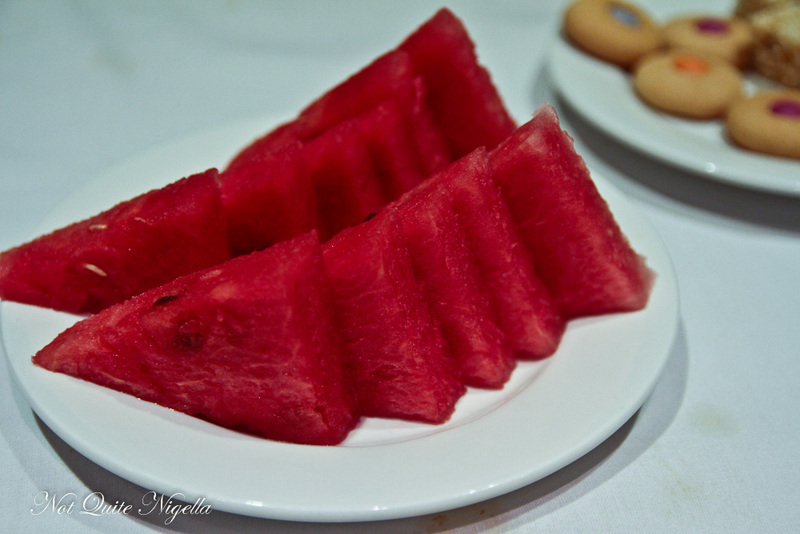 The watermelon is refreshing and Mr NQN makes fast work of it while I content myself with the rice crispy slice. So tell me Dear Reader, do you take notice of things like surcharges? Would you change your birthday dinner to avoid paying one?